0% Introductory APR on Balance Transfers1 0% introductory APR for 15 months on balance transfers made within 45 days of account opening. After that, a variable APR will apply, 17.24%, 22.24% or 27.24%, based on your creditworthiness. There is a fee for balance transfers. Important Information about the RCI Elite Rewards Credit Card Program: Offers may vary. Please review the below and the Terms and Conditions, which include the Reward Rules for full information about the Reward program, interest rates and account fees and terms for this particular offer before applying. 1. Offer subject to credit approval. If at the time of your application you do not meet the credit criteria previously established for this offer, or the income you report is insufficient based on your obligations, we may not be able to open an account for you. This offer is available through this advertisement and may not be accessible elsewhere. For complete pricing and other details, please see the Terms and Conditions. Annual Fee is $0. 0% introductory APR on balance transfers made within 15 days of account opening is applicable for the first 15 billing cycles that immediately follow each balance transfer. This introductory APR offer does not apply to purchases and cash advances. For new and outstanding balance transfers after the introductory period and all purchases, the variable APR is 17.24%, 22.24% or 27.24% depending upon our review of your application and your credit history at account opening. The variable APR for cash advances is 27.49%. The APRs on your account will vary with the market based on the Prime Rate and are subject to change. The minimum monthly interest charge will be $0.50. Balance transfer fee: 3% (min. $5). Cash advance fee: 5% (min. $10). Foreign transaction fee: 0%. See Terms and Conditions for updated and more information about the terms of this offer, including the "About the Variable APRs on Your Account" section for the current Prime Rate information. 2. Bonus Rewards Offer: Receive a one-time 2,500 Bonus Rewards in addition to the regular Rewards you earn after making your first purchase with this card. Bonus Rewards will post within 60 days of the first purchase. This promotion is limited to new Cardmembers and may be cancelled at any time without notice. a) Earn five (5) Rewards for each one dollar ($1) in net purchases on eligible RCI products and services (excluding RCI Travel, RCI Points Partners, RCI Cruise, Lifestyle Benefits, and Experiential Vacation purchases; b) Earn two (2) Reward per one dollar ($1) spent on eligible travel purchases (including include air, hotels, car rentals, cruises, travel agencies, trains and buses, etc.) and (c) Earn one (1) Reward per one dollar ($1) spent on all other purchases. Conditions and limitations apply. Refer to the FAQs and Reward Rules within the Terms and Conditions for additional information about the rewards program. 3. RCI Member RewardsSM Redemption: In order to redeem Rewards for RCI Member RewardsSM, you must have a current RCI Subscribing Member account. RCI Member Rewards are issued in the specified amount, which will appear as a credit to the cardmember's designated RCI account and you may apply that credit to pay for certain RCI products and services. RCI Member Rewards may not be used for RCI Travel, RCI Points Partner, RCI Cruise, Lifestyle Benefits, Experiential Vacations, and timeshare resort maintenance fees. Certain other rules, restrictions and exclusions may apply to the use of RCI Member Rewards. Refer to FAQs and Reward Rules within the Terms and Conditions for additional information. 4. Cash Back Redemption: Redemption for cash back statement credits start at 2,500 Rewards. If you redeem for cash back statement credit, it will be posted in 1 -2 business days and appear on your Account billing statement within 1 billing cycle. Additional conditions and restrictions apply. Refer to the Reward Rules within the Terms and Conditions for additional information about the rewards program. 5. $250 Vacation Credit: Earn one (1) $250 Vacation Credit after spending $10,000 in net purchases each calendar year. Net purchases must be made from Jan 1 — Dec 31 each year. Vacations are limited and subject to availability. 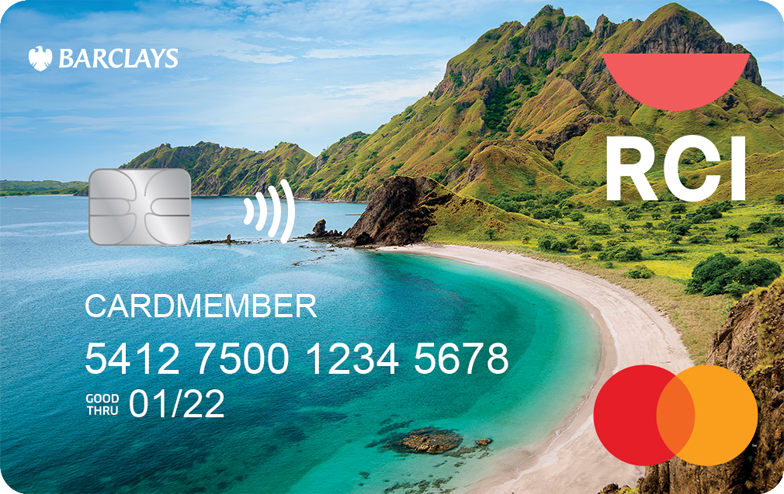 Vacation Credit is not valid for use on RCI.com. The Vacation Credit has no cash value. Conditions and limitations apply, including how the Credit must be redeemed and the redemption window, please refer to the FAQs and Reward Rules within the Terms and Conditions for full details. 6. Redemption Bonus: Earn 5% of your Rewards back as a redemption bonus, to use toward your next redemption, every time you redeem. Redemption bonus Rewards are added to your Account within one business day after your redemption is processed. Refer to FAQs and the Reward Rules within the Terms and Conditions for additional details. RCI® Elite Rewards® Mastercard® is issued by Barclays Bank Delaware (Barclays) pursuant to a license from Mastercard International Incorporated. Mastercard is a registered trademark, and the circles design is a trademark of Mastercard International Incorporated.